Hello and thank you for visiting The Little Lollipop Shop website. We receive over a dozen enquiries per day requesting samples. While we would LOVE to offer all potential customers free/cheap samples, it is simply not possible as all my lollipops are handmade, to order in a large variety of colours, flavours, shapes and designs. Every sample design requires an entire batch of custom lollipops to be made, which equates to at least 9-11 lollipops going to waste for every sample we send out. That’s a lot of time and money wasted! What we do offer is a sample batch of 5 plain coloured lollipops in an assortment of flavours. You are able to purchase these here. 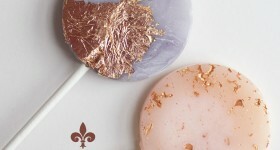 The lollipops are tinted in my most popular colours and have a hint of sparkle. Sample packs are sent out in the first week of every month. Please get in touch if you require samples urgently. The other option is to buy the lollipops from my website. However, depending on size, there is minimum order of 10 lollipops per design, colour and flavour. Thanks again for visiting our site and for your interest in our lollipops. If you’d like to get in touch to discuss things further, please use the contacts page and we’ll get back to you ASAP.